Now supports Affordable Care Act reporting. Convenient: Includes FREE electronic filing to IRS and recipients, for 25 filings. Supports W-2 (STANDARD 2-UP, 4-UP BOX AND 4-UP HORIZONTAL), 1099 MISC., 1099 INT, 1099 DIV, 1099 R, 1099 S, 1099 B, 1099-PATR, 1098, 1098T, W-3, 1096, 5498, W2G forms and more. 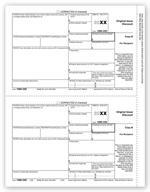 Compatibility: Works with both continuous and laser pre-printed forms, as well as blank tax forms. Allows multiple filers/payers and 25 Free Filings (additional filings available for additional fees). Microsoft 2007 or higher, full version (I-Cloud base, Starter or Open Office will not support the e-file site). SSN masking protects your receipient's Social Security Numbers by masking the first five numbers. All Data files are password protected. Access your e-filing information for up to 4 years on the e-file platform. 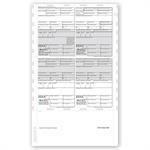 Prints forms and data to blank paper (except Copy A) and also to preprinted Laser forms. Speak to a customer service specialist at 855-5-FORMS5 or 855-536-7675.